James and I stand in the airy workshop of Larry Bowers. Around us are the hulls of canoes Larry is building, in various states of completion. There is a sweet smell of wood and varnish. Larry takes from the wall several patterns for canoe paddles and we ask him about the advantages of each. He shares stories about a few of the paddles he has made. We look at and hold a few of his favourites. Paddles, even more than canoes, connect us to water. Beautiful paddles connect us to something deeper. James has done his research. He laid out his findings to me on the drive from Nanaimo to Campbell River where Larry lives and runs his business. James is keen on a traditional Algonquin blade pattern and his reasoning is this: the Algonquin blade has a slightly narrowed and rounded tip, allowing a clean entry to the water with less friction than other designs. Between a ½ and ¾ of the way up the blade it widens slightly before tapering back to the shaft. The advantage of this shape is that when the blade is drawn back from that initial entry and submerged fully beside the canoe the wider section of the blade engages at a point where the arms have their greatest leverage, putting the maximum blade surface in the water during the most powerful portion of the stroke. It is a logical and persuasive argument and as we stand looking at the templates we listen to Larry tell of the two paddles he has favoured over the years. One of them is very close to the shape of the Algonquin blade. Both James and I decide to order this blade shape from Larry. But I am also attracted to an unusual shaped blade that Larry describes as a Cree design. He tells us that he used the template to build a paddle once but that he rounded the tip more, moving the shape from an exaggerated “tip-heavy” design to a more beavertail-style tip. It turned out to be a good one. Unlike a standard beaver tail, this “Larry Bowers” custom shape (on the left in the picture above) has the long straight sides of the Cree style with the pleasing tip of the beavertail. I decide on this blade shape for my second paddle. It seems to defy the logic associated with the Algonquin blade, and while my rational mind is warning me to reconsider the choice I have a strong intuition telling me there is something right about the shape. I wonder if I am being drawn in by the novelty of it or maybe it’s aesthetics, but secretly hope there something I don’t know yet about this design that makes it a winner. Next we talk about shaft length. I produce from the vehicle an old cheap beavertail paddle which I inherited from my father and found to be just the right length for the low paddling station of my Placid Boatwork made Spirtfire pack canoe. For the Algonquin blade I request the shorter shaft length creating a 58 inch paddle with 25 inches of shaft and 27 inches of blade, 3 inches of throat, and 3 inches of grip. I learn later that this is a very close to the average for historical paddles that Doug Ingram reports in his online article, Historic Paddle Reproductions (http://www.redrivercanoe.ca/Historic%20Paddles.htm). I order the Cree blade in the dimensions that Larry recommends, trusting this craftsman’s experience and familiarity with the material. At 59 and ½ inches it will be longer than any of my other single blade paddles and I plan to use it primarily with the Solo+. John Bell of Red Tail Paddles states, “Probably 90% of all adults can use a 54 inch paddle with a 20 inch blade,” though Bell does make paddles up to 63 inches long. His comment worries me, causing me to wonder if the Cree paddle will be too long, but then when I browse pictures of old voyageurs in their canoes and recovering from the day’s paddling in their 19th century camps, I notice how long and thin their paddles are. The voyageurs used various lengths of paddles but almost all of them had thin blades because they paddled hard and fast. Such hard fast paddling put tremendous strain on the paddles and ones made of spruce, though light, broke often. Therefore the Voyageurs chose hardwoods for their paddles, and made many of them, often on route. The paddles Larry makes for us are a combination of spruce and yew (Spruce on the left above, and Yew on the right). The spruce is Sitka Spruce, a clear springy wood from the noble giants made famous on Vancouver Island as part of the sky garden ecosystem studied in the Carmanah Canopy Project. The Sitka Spruce tree grows with a very straight trunk and is one of the tallest on the coast, only surpassed by the Douglas Fir and Western Hemlock. The light straight grained wood is used for everything from guitars to boats and contains pleasing mottling where the wood is rounded. The yew wood used in our paddles has a pedigree. Sometime before his death in 1944 my grandfather strode into a forest near Nelson and cut down some yew trees. As a woodworker raising a family through the great depression he made a wide assortment of wooden objects for people, from cabinets to houses. The Yew he prized for rifle stocks. Two pieces of yew were carefully dried and stored for future use. The years passed and my father inherited the wood and stored it in our woodshed where I saw it from time to time while growing up. When my parents moved to a smaller house upon retirement the yew wood passed on to me. It sat in my woodshed for another 10 years. Larry explains to us that he regularly uses the hard and durable yew wood laminated onto spruce to create a resilient and responsive paddle. Larry demonstrates by leaning hard on his own laminated spruce and yew paddle so that the paddle bends dramatically and springs back. Yew was a choice wood for archery bows for centuries and is still used today for this function. A few months after we placed our order Larry calls to tell us the paddles are ready. We head to Campbell River to pick them up. They are beautiful hanging in his shop and I can’t help grinning as we examine their beautiful smooth surfaces and deep natural colors. After chatting with Larry for awhile we stop only briefly for cheesecake at Cheescake 101 a short distance from Larry’s shop, before beetling out to Echo Lake to try out the new paddles. Larry has also given us to try a paddle he just made for himself, along with a much shorter paddle that James spied in Larry’s shop. On the water I notice immediately that the paddles feel too long for the pack canoes, but a curious thing happens. The very long Cree style paddle has an interesting quality. Trying to lift the long blade clear of the water proves to be a little awkward but keeping the blade in the water and knifing it forward in an Indian stroke is enjoyable and effective. The power in the correction is impressive as the long blade rises almost vertically at the end of the power stroke before slicing forward for the next stroke. I look over at James and notice that he is trying different holds on Larry’s paddle, abandoning the high grip and grasping the paddle at varying heights along the shaft. I switch to the shorter Algonquin blade that I had designed specifically for this boat and appreciate immediately the familiar shaft length from my Dad’s old paddle. Interestingly, however, the paddle does not function as well on the Canadian stroke. I adjust myself accordingly and find the Indian stroke works extremely well with this paddle. James passes off Larry’s paddle to me and I pass over my paddle with the shaft length 3 inches shorter than his. He tries them both and decides that for his Rapidfire a shaft length somewhere in the middle would be perfect. The following weekend I take my Wenonah Solo+ to Westwood Lake, the water jammed to overflowing with Nanaimoites seeking relief from the 37 degree summer hot spell. I paddle to the far end of the lake, trying my two new paddles and comparing them with my shorter Redtail Ottertail as I go. The Redtail is 53 and ½ inches long, a full 6 inches shorter than my new Larry Bowers Cree, and a mere ½ inch shorter than John Bell’s recommended average. The Redtail Ottertail and the new Algonquin are almost identical in blade shape, the Algonquin blade being about 3 and ½ inches longer with a ½ inch longer neck transition. They perform similarly, but the slightly longer blade on the Algonquin gives a notably better grip on the water, and the bobbled grip allows me to spin the paddle effortlessly while performing the Indian stroke. The Cree surprises me by feeling less substantial than the Algonquin in the Solo+ and I compare the blade shapes and discover that while they are identical in length, the Algonquin is wider in the middle. This slight difference is noticeable on an extended paddle around the lake. Both blades whistle nicely on the forward underwater slice and the do not seem to resist as much as the Redtail. Sure enough, on examining the blade edges Larry’s paddles are more knife-like at the edges and the blades are noticeably thinner. I spend about an hour sculling and testing pries, jams, and reverse sculls. For all these actions the Cree style is superior, though challengingly exact in a bow jam, perhaps because of the long length and the Solo Plus’ minimally rockered hull and sharp entry lines. I find a private bay on the south western end of the lake and practice maneuvering between the many deadheads and dead trees there. The limitations of the Solo+ in such situations becomes apparent. This straight tracking canoe with it’s excellent secondary stability is not easy to spin, even when heeled. The surprises of the paddles and my continuing curiosity over the blade shapes drive me to research. I get the best book I can find on the subject out of the library — Graham Warren and David Gidmark’s Canoe Paddles: A Complete Guide to Making Your Own. On page 12 of this detailed and informative work I see a diagram of a Passamaquoddy paddle which is very close to the “Cree” design Larry showed us. On the same page the Algonquin shape is clearly illustrated. The Cree paddle diagram on the page is similar, but has a clear transition at the neck, but on the next page is a Western Cree paddle that has less of a distinct transition. I study the drawings in detail and decide that Larry’s design in a cross between the Passamaquoddy and the Cree. It has the long blade and straight taper of the Cree, with the smooth neck of the Passamaquoddy. Warren and Gidmark put Iroquois blades in three catagories: Beavertail, Elongated beavertail, and Straight-sided rounded. Ojibiway paddles turn up under Elongated beavertail and Straight-sided rounded, as well as Ottertail. Of the 10 basic categories Warren and Gidmark sort all historic blades into, 5 have the widest part of the blade near the middle of the blade, 2 have the widest part near the neck, and 3 have the widest part near the tip. Clearly the majority of blade shapes from indigenous tribes of North America place the widest part of the blade near the middle to take advantage of the mechanics James had described to me earlier. I finally decide that the 9th category most closely fits my Cree style blade, what Warren and Gidmark call the “Straight-sided, rounded” blade. A search online of the major paddle manufacturers reveals that most produce a version of the Ottertail, Beaver Tail, Elongated Beaver Tail, or the contemporary White water paddle (large surface square bottom). One company, Shaw and Tenney, has a paddle they call the Racine. They explain that it is a replication of a paddle originally sold by the Racine Canoe Company of Wisconsin. The paddle was offered with the sale of each Racine Canoe Company wood/canvas canoe sold until the company went out of business in the 1920’s. Shaw and Tenney report that the Racine is becoming their best selling paddle with many repeat orders. 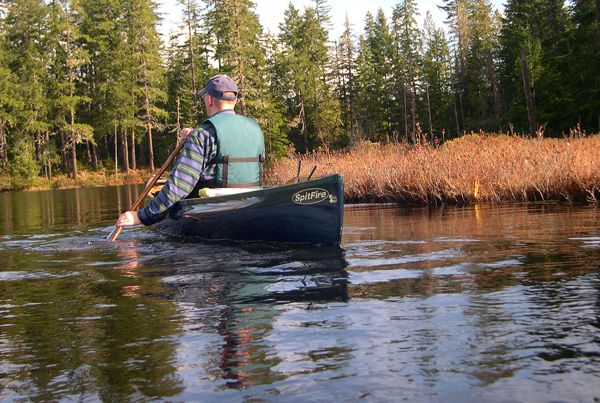 They claim that it is a very quiet paddle, and, because the blade is only 5” wide, lends itself well to the North Woods stroke as well as to solo paddling. The Racine is available in the two original lengths, 58-1/2" and 63-1/2", which they say seem to work perfectly for everyone. I can find no other paddle on the market that matches the profile of Larry's Cree design. Even the Racine is closer to the Algonquin design with its very slightly tapering tip. Interestingly the majority of traditional wooden paddle builders (Turtle, Kettelwell, Redtail, Greyowl, and Shaw and Tenney) sell version of the Ottertail or Algonquin, usually with a Beavertail or two to round out the selection. A few, such as the noteworthy Whiskyjack, almost exclusively produce modified white water blades. Still others such as Anderson, Carlisle, Cricket, Foxworx, and Sawyer, produce beefy versions of the ottertail and Algonquin along with a plethora of square bottomed whitewater styles. Beefy blades with areas larger than 140 square inches are generally recommended for short tripping, white water, and sprint racing, as well as dragon boating and stand up paddle boarding. The larger area provides greater thrust. Thrust is proportional to blade area according to Warren and Gidmark (blade area x (stroke rate)2 and sustainable stroke rate is proportional to 1/(blade area). Stroke rate has a greater effect than blade area does because its contribution is squared. Aspect ratio is another important factor in beefy blades. Short fat blades exhibit more drag than long narrow ones of the same surface area. So in effect you get more bang for your buck with a short fat blade. Shorter blades are also easier to handle when the blade is lifted out of the water while paddling or when switching sides. But short fat blades have a few drawbacks. Firstly they are more difficult to keep close to the hull when paddling and secondly they splash more on entry. Also they flutter more when doing a below water slice and tend to catch and veer more in the hands of a novice. The lower aspect paddles, on the other hand, while providing less overall drag, go deeper into denser water, slice better, and enter the water with less splash. Low aspect paddles are longer, and therefore less effective in shallow water but more effective for long reaching braces. A low aspect paddle with a blade that concentrates more area farther away from the paddler’s fulcrum (like my Cree style paddle does) provides more leverage making it better for sculling and steering. Doug Ingram of Red River Canoe & Paddle is a paddle builder who helped clarify for me the great diversity in Paddle blades. Ingram produces the widest range of blade shapes on the market and his Cree replica convinced me that Larry was, not surprisingly, right to call my paddle a Cree design. Ingram writing about historic North American paddles says, “Amongst the many different blade shapes that have been conceived, traditional blades can be loosely categorized as being either straight-sided or round-sided. Surface areas are concentrated near the throat, evenly along the length, or near the tip. Tips are pointed, rounded, or blunt. I began to wonder what, then, are the constants of these traditional designs. Blade length varies, but averages in the 27- to 30-inch range. Width also varies, but blades are rarely wider than 6 inches.” Ingram’s conclusions were that trial and error sifted out the lengths and blade shapes that survived. Ventilation seems to be an important factor in this sifting process. Large blades with abrupt transitions at the throat allow air to enter behind the paddle, making them inefficient if paddled too quickly. The other factor that creates ventilation is when the blade is not fully immersed in the water. The short fat blades lose most of their aspect ratio advantage if the blades are not fully immersed while paddling. Intuition and time on the water teaches most people this lesson, and I notice when teaching new paddlers that I often have to encourage them to get their blade hand close to or in the water. This advice does two things. It fully immerses the paddle blade and lowers the paddle overall, bringing the grip hand lower as well. Many photos of people paddling, including two of the 4 pictures on the inside cover of the instruction booklet that comes with every Wenonah canoe, show paddlers with their grip hand high in the air, sometimes over their heads! The optimal position advocated by many instructors is to have the grip hand move in an area between the shoulder and the lower ribs. Never higher than the chin. Doug Ingram introduced me to several helpful ideas in his article. Most important was his description of the “Northwoods Stoke” which seems to be a modified Canadian stroke that keeps both arms low to the gunwales. The lower the arms, the less energy is used holding them and the paddle in the air. I now finally understand the purpose of the large grips on so many traditional paddles. The way of holding the paddle grip in the Northwoods Stroke had never occurred to me but I plan on experimenting with it in the future. I can not recomend Larry Bowers of West Coast Canoe as he took our money we paid if full for a canoe and he did not deliver when promised he then changed the dilivery dates so many times we asked for our money back then said he would pay did not and we now have a judgement against him and have a lien and were not the only ones. Very bad way to run a buisness. This will follow him to Rocky Mountain House when and if he sells his house as he has others who have a lien on him as well. Hopefully we can recoupe our money at some point. Thank you for the information regarding Larry Bowers. This is the second time I have heard of a person paying him, then never seeing a canoe. I am sad to hear about it since Larry seems like such a good hearted fellow. We did wait a long time for these paddles, and I was prepared at one point to walk away from the arrangement. I really believe he intends to deliver, but for some reason, is not able to. Larry, if you are reading this, I will have to remove my link to your site until I hear that the canoes have been delivered, or the money has been returned. It must be a lot of pressure on you Larry, but I believe you have the talent and time to do it. Excellent article! Thanks for posting it. Just a comment about paddle lengths: I was very surprised to see the claim by Red Tail Paddles that a 54" paddle will be fine for 90% of paddlers. That's too short, in my opinion. Of course, that depends on a lot of factors including the paddler's height and proportions, whether he or she is a bow or stern paddler, whether they kneel or sit on the seat, etc. I remember seeing a formula for how to choose a paddle that, if followed, would have had me using a paddle of something like 48"! I contacted the people at the website where that formula was published and told them that I use a 62" paddle and their formula would suggest that I should use a child's paddle. They told me that I must have very unusual proportion but the fact is that I am six feet tall and of just about the most average proportions imaginable except that my shoulders may be a little bit wider than average. I am a stern paddler and I have used a 62" paddle for many years but I have always felt that it could be a couple inches longer. My wife and I are leaving on a canoe trip this week and I discovered that I had lost my spare paddle so I ordered one from Shaw & Tenney. They recommended that a six foot stern paddler use a 68" paddle. For me, that means that the paddle almost precisely reaches my nose when I stand on the floor with no shoes on. That is a rule-of-thumb that I have heard of before and it works out just about perfectly for me. However, I don't yet know how the longer paddle will work out. But I know one thing: There is no way a 54" paddle would work for me. In fact, my wife's paddle (she's 5' 6")is, if I remember correctly, 58" and it feels way too short for me. Even she says that anything shorter would be too short for her. used a Bending Branches laminated paddle with an 8" blade and a squared end. I just noticed that Bill Mason uses an almost identical paddle in his Path of the Paddle videos except that it is not laminated. We are going to paddle down the lower Wisconsin River and a couple hundred miles down the Mississippi next week and I think my old paddle with the 8" blade(my new one is 6 1/2" wide) will be the best choice for the Wisconsin which is very shallow and has many sandbars. The square blade will allow me to apply more force when I can't get the blade deep in the water in those shallow areas. My new Shaw & Tenney paddle is their Penobscot model. I think the Racine is too narrow for me. At 60 years old, the one thing I can do as well now, if not better, than when I was 20, is paddle. I am a powerful paddler and a wide blade is no problem. Even the 6 1/2" blade may not be wide enough for maximum efficiency for me. I will find out next week. Again, thanks for posting this excellent article. Very informative! Thanks for the interesting personal recommendation re: paddle lengths. I value your years of experience and was a bit surprised to hear you say how much you like the wider blades. Good to know! I continue to experiment with paddles of various sizes and shapes and find that I keep being surprised. My Cree/Iroquois paddle has become even more of a favorite since I wrote this article. While recently paddling my friend Paul's Rendezvous I found the Cree/Iroquois performed even better than with my own "lower to the water" boats. Now for comparison, this paddle of mine reaches my Adam's apple, so is not as long as you prefer, but a lot longer than some experts recommend. Interestingly I absolutely love to use this paddle with my Spitfire in the Canadian stroke. It feels made for the slow vertical correction at the end of the stroke. The length gives it the advantage but also makes it slightly awkward to raise out of the water for the next stroke. My solution is a sort of hybrid of the Canadian and Indian stroke. I can't tell you how satisfying it is to paddle this way. Please let me know how you like your new paddle. Thanks for commenting. Update. 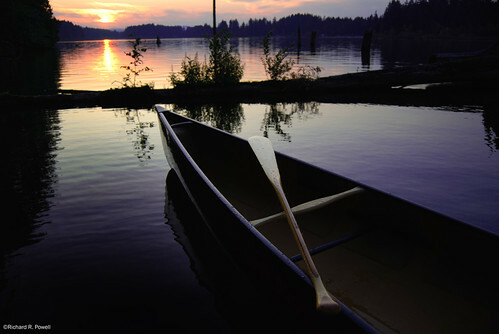 I just came across a photo on Murat's excellent paddle carving blog,http://paddlemaking.blogspot.ca. The photo is the third down the page here: http://paddlemaking.blogspot.ca/2009/11/cree-carved-paddles.html the paddle on the right is almost the exact shape of my favorite. It gave me a real lift to see that these paddles are still being made. I wish more could experience their unique design. The more I research it the more I conclude that Larry was right, the one I prefer is a Cree design.